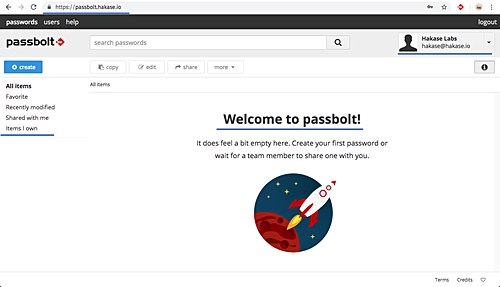 Passbolt is a free and open source password manager for teams. It allows team members to store and share credentials/password securely. Passbolt is created with PHP and can be run under the LEMP stack or run as docker container. 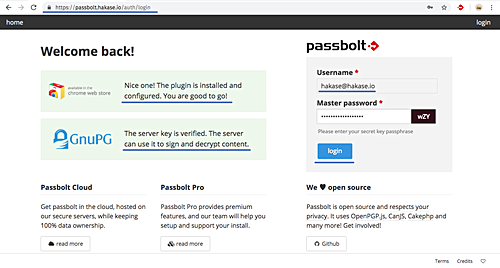 In this tutorial, we will show you step-by-step install and configure open source password manager 'Passbolt' on CentOS 7 server. Passbolt is a web application developed with PHP, and we will run it under the LEMP (Linux, Nginx, MySQL/MariaDB, and PHP-FPM). The first thing that we will do for this guide is to install all package dependencies needed for the Passbolt installation, including installing EPEL and Remi PHP repositories, php composer, gcc etc. Add and enable the Remi PHP repository. Now install packages dependencies composer, git gcc etc using the yum command below. Wait for all packages installation. In this step, we will install the MariaDB database and then create a new database and user for Passbolt installation. 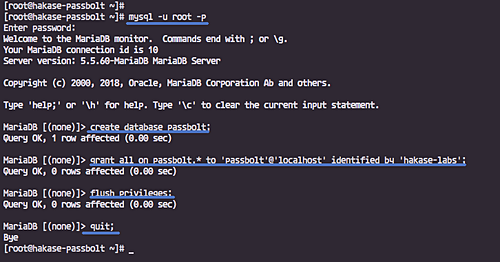 Install MariaDB server using the yum command below. After the installation is complete, start the MariaDB service and enable it to launch everytime at system boot time. Now we need to configure the 'root' password for MariaDB. Run the 'mysql_secure_installation' command below. Type your new root password. And the MariaDB root password has been configured. Next, login to the MySQL shell using the 'root' user. Create a new database and user named 'passbolt' with password 'hakase-labs', run MySQL queries below. The MariaDB server has been installed on CentOS 7 server, and the database for 'Passbolt' installation has been created. After installing the MariaDB server, we will install Nginx from the EPEL repository, and PHP-FPM packages using the Remi repository. After the installation is complete, start the Nginx service and enable it to launch everytime at system boot. Now install PHP-FPM with all extensions needed using the yum command below. And if the installation is complete, start the PHP-FPM service and enable it launch everytime at system boot. The Nginx web server and PHP-FPM has been installed. Install the certbot tool on the system. Now stop the nginx service. 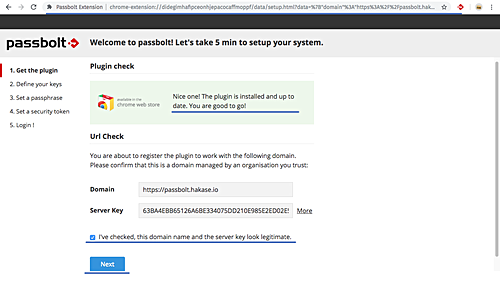 And generate SSL Letsencrypt for the passbolt domain name 'passbolt.hakase.io'. Run the certbot command below. The certbot tool will run a temporary web server for the verification. And when it's complete, you will get your certificate on the '/etc/letsencrypt/live/' directory. In this step, we will configure the Nginx web server by creating a new virtual host configuration for the Passbolt, and configure the PHP-FPM and install the PHP GnuPG support. Go to the '/etc/php-fpm.d' directory and edit the default pool configuration 'www.conf' using vim editor. Change the default user and group to the 'nginx' user. Change the port listen for PHP-FPM to the sock file as below. Uncomment those lines below and change listen.owner and listen.group for the sock file to 'nginx'. Now we need to change the owner of the PHP session directory and install the PHP GnuPG extension support. Change the permission of php session directory. Install the PHP GnuPG extension using the pecl command and activate it. The PHP GnuPG extension has been installed. Go to the '/etc/nginx/conf.d' directory and create a new virtual host file 'passbolt.conf'. Test the nginx configuration and make sure there is no error. Now restart both Nginx and PHP-FPM services. Configurations of Nginx web server and PHP-FPM has been completed successfully. In this step, we will download the passbolt web application and generate a new OpenPGP key that will be used for the Passbolt API. Go to the '/var/www' directory and clone the passbolt web application. Now install the 'haveged' package and start the service. Generate a new OpenPGP key using the gpg command below. Type your details such as email, the expiration days etc. The PHP GnuPG extensions don't support the OpenPGP Key passphrase, so let the passphrase stay blank. After it's complete, check all key available and write down the 'fingerprint' of your key. Now export the public and private key to the '/var/www/passbolt' directory. And change all those keys permission and owner of the '/var/www/passbolt' directory. The Passbolt web application has been downloaded, and the OpenPGP key has been created. Before installing all dependencies for 'Passbolt', we need to initialize keyring of gpg key for nginx user. Now login to the 'nginx' user and go to the '/var/www/passbolt' directory. 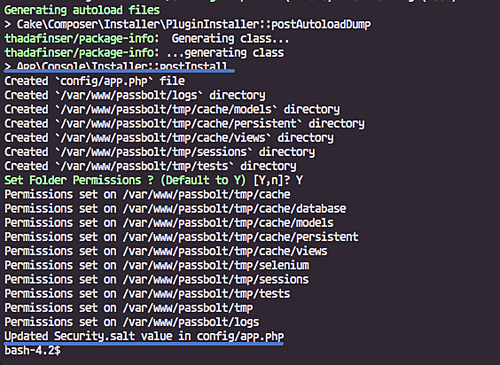 Install all passbolt dependencies using the composer command below. When it's complete, copy the default config file of the app and edit it with vim. In the 'App' section, change the domain name with your own domain name. // A base URL to use for absolute links. // The url where the passbolt instance will be reachable to your end users. In the 'Datasources' configuration, type your details database info. Under the database configuration, add a new 'ssl' configuration to force all connection to secure https. For the SMTP mail configuration, change everything with your details. // Is this a secure connection? true if yes, null if no. // Defines the default name and email of the sender of the emails. And lastly, paste the 'fingerprint' of your OpenPGP key and uncomment those public and private configuraiton lines. // Server private key fingerprint. Now install 'Passbolt' using the command below. You will be asked to create a new admin user and password - type your details. And in the end, you will be given the 'registration' link, write it down on your note. Open your web browser and install the 'Passbolt' extensions of your web browser. Following is the link of passbolt extension for Chrome browser. Install the extension. And you will a page similar to the one shown below. Check the box on the bottom and click the 'Next' button. Now you will be asked for creating a new key for the user. 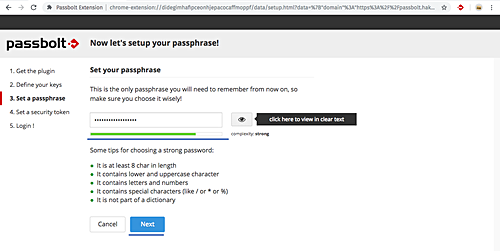 Setup the 'Passphrase', type your strong passphrase. Click 'Next' button. Backup your key by pressing the 'Download' button and click 'Next' again. For the security token, leave it default and click 'Next'. And you will be redirected to the Passbolt login page. Type your 'Passphrase' and click 'Login'. And you will see the Passbolt user Dashboard as below. Passbolt open source password manager installation on CentOS 7 has been completed successfully. Open new HTTP, HTTPS, and SMTP ports on the server. Now reload the firewalld configuration. Permission for the 'Passbolt' webroot directory. Permission for the Nginx gnupg keyring directory. Muhammad Arul is a freelance system administrator and technical writer. He is working with Linux Environments for more than 5 years, an Open Source enthusiast and highly motivated on Linux installation and troubleshooting. Mostly working with RedHat/CentOS Linux and Ubuntu/Debian, Nginx and Apache web server, Proxmox, Zimbra Administration, and Website Optimization. Currently learning about OpenStack and Container Technology.